With the support from the Arab Regional Network on Women, Peace, and Security- El Karama, the Palestinian Initiative for the Promotion of Global Dialogue and Democracy (MIFTAH) has collaborated with the Women’s Centre for Legal Aid and Counseling (WCLAC), the Palestinian Working Woman Society for Development (PWWSD), and Women Media and Development (TAM) in preparing the evidence based report “Palestinian Women: the Disproportionate Impact of the Israeli Occupation.” The report aims to draw on Israeli human rights violations under international law and highlight the effects these violations have on Palestinian women. The report was discussed in a “side event” of the Commission on the Status of Women (CSW) 62nd session in New York during March 2018. The purpose of the side event was to engage regional and international human rights networks and human rights defenders and women movements in advocating for the implementation of human rights provisions through the enforcement of international ratified conventions and agreements. 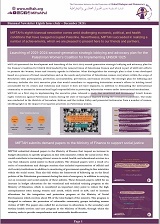 The report includes personal testimonies and quantitative research of four categories of Palestinian women: women refugees, female Jerusalemites subjected to residency revocation/family reunification refusal; female prisoners subjected to gender-based violence and Gazan women, focusing on denial of their access to healthcare. 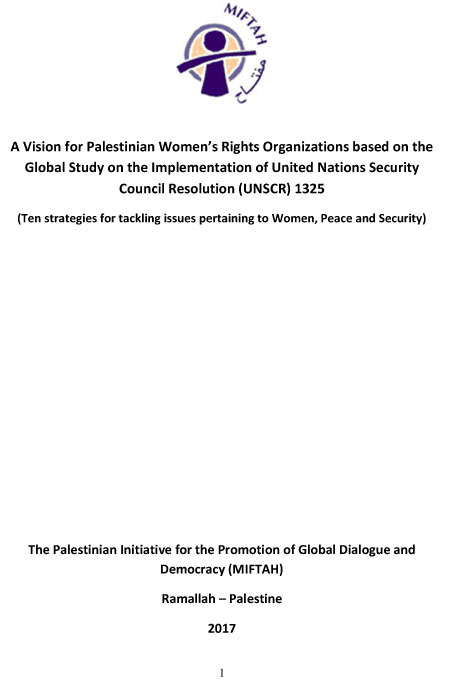 The main findings of the report shed light on the direct discrimination that Palestinian women are subjected to and their effects that are particularly damaging to women. The findings reflect the results of an armed occupation coupled with a patriarchal society and can be contextualized by broader Israeli motives: “to change the physical character, demographic composition, institutional structure or status of the Palestinians”. The report uncovers how Palestinian women living in refugee camps in the West Bank and Gaza live under high levels of violence. Many Palestinian refugee women experience a “triangle of oppression” according to MIFTAH, this is due to a combination of violence committed by the Israeli occupation, the daily life and traditional attitudes towards women and they bear the brunt of Israeli abuses while forced to endure in already suppressive and patriarchal environment. MIFTAH found that 33 percent of the interviewed women had been directly exposed to physical assault by Israeli Occupation Forces. As many as 21 percent had been exposed to beatings or tear gas at Israeli checkpoints while they were pregnant, and 4 percent reported that they aborted or gave birth at Israeli checkpoints. Moreover, 24 percent were forced to live in shelters or with extended family and 37 percent had been exposed to detention or interrogation. The physical violence women experience while living in the refugee camps is alarming and the number of psychological violence is even higher. Moreover, 72 percent of Palestinian women feel panicked when they hear the sounds of Israeli bullets, war jets, bombs or Palestinian ambulances, and 88 percent confirm that they feel terrified when Occupation Forces storm the camp. These women live in a mentally stressed environment where it is hard to feel safe because they have experienced or know that physical violence is a part of their everyday life. Recognize the Palestinian right of return, as contained in United Nations General Assembly Resolutions 194 and 513. It is also necessary to confirm United Nations Security Council Resolution 1325, pertaining to the rights of women and peace, along with Security Council Resolution 237 of 1967, calling on Israel to respect human rights in the regions affected by the Middle East conflict of 1967, to ensure safety and security for their residents and facilitate the return of the displaced. Confirm the importance of implementing United Nations General Assembly Resolution No. 3236 of 1974. Donor states and organizations should fulfill their obligations towards UNRWA so that the Agency can continue providing services to Palestinian refugees. Provide psycho-social support for individuals exposed to traumatic experiences as a result of violations committed by the Israeli Occupation. This should include a heightened role for international bodies (governmental and non-governmental organizations) in Palestinian refugee camps. Palestinian Jerusalemites are facing the challenge of resisting the Israeli forces of removing Palestinians from the region and reshaping east Jerusalem toward a majority of Israelis. Between 1967 and 2016, 14,595 Palestinians from east Jerusalem had their residency status revoked. Israel targets the Palestinian Jerusalemites with their policies of residency revocation and family reunification by making it very difficult to stay in Jerusalem. Palestinian Jerusalemites have to live in Jerusalem to have the residency permit, but if they marry a non-Jerusalemite they cannot live together in Jerusalem without going through the process of family reunification, which is a demanding process with an average waiting period of ten years, it is costly and the Israelis may refuse the application without giving any reason. PWWSD has documented a number of cases of attempted family reunification one of these is Afaf A who explains how she after almost ten years of applying still are denied residence permit: “To this day, we are denied the right to know the true reason as to why I am unable to receive a Jerusalem ID. All in all, this entire case cost me up to nearly 70,000 NIS.” Afaf’s story is a typical example of the burden that reunification places on women’s family life and social relations. The policy of residency revocation forces Palestinian Jerusalemites to leave their homes and it divides families, which can lead to a traumatic fear of separation form children and homes for the women living in Jerusalem. This creates an enormous psychological stain and stress upon women. Israel is denying Palestinians fundamental liberties such as the right to movement and work. This policy also has a negative impact for female victims of domestic violence because they fear going to authorities in case they are forcibly transferred away from their children. Reinstate the residencies of all Palestinians who wish to reinstate their Jerusalem residency status and give all current residents of Jerusalem indefinite right-to-remain. Immediately repeal the “temporary order” to the Law of Citizenship and Entry into Israel (2003) related to family unification. Grant Palestinian spouses of Jerusalem I.D holders Jerusalem residency status. Take positive steps to facilitate family reunification; compensate those who have lost large amounts of money due to the costly procedures. The Palestinian female prisoners experienced unhygienic prisons cells that are overcrowded and flooding with sewage. The women prisoners describe the food as inedible and the cells as filthy. The conditions in the prisons are very critical and they are not equipped for female prisoners. Often in the prisons there is no awareness for cultural or gender-based sensitivities and invasive bodily searches are a popular method for Israeli soldiers to humiliate the prisoners. Palestinian women are frequently labeled security prisoners and are placed with Israeli criminals that in some cases will extend the assaults and humiliation. Demand that Israel cease its practice of transferring Palestinian female prisoners out of Palestine, a practice illegal under international law. Grant all Palestinian detainees access to legal services and to their family during family visits. Accommodate such access with complementary practices at all relevant checkpoints. Assert, without qualification, the absoluteness of the prohibition of torture. Put an end to any torture, inhuman or degrading treatment in Israeli prisons. The blockade of Gaza has been going on for 11 years and Israel is not letting go of its grip, actually it seems that Israel is tightening its grip. On the basis of testimonies gathered from women in Gaza has WCLAC highlighted three areas of concern: Israeli border polices health rights and access to health, and the effects of the Israeli blockade on Gaza. The approval rate of patient permits to exit Gaza to be treated has declined rapidly during the recent years. In 2012, 92 percent of patients’ permits were approved while in 2017, the approval rate had declined to 54 percent. In 2016, 31.4 percent of these applications were delayed for months or even years beyond medical appointments the consequence of this is that diseased people get sicker and in some cases this results in death. Israelis are also very observant of what goes into Gaza even when it concerns essential health care, medicine, fuel and adequate nutrition. The approval rate for health related access was 48 percent in 2016. These numbers show clearly how Israel is failing to facilitate humanitarian access and therefore is preventing the development and functioning of human life inside Gaza. The lack of rights to health care is detrimental to pregnant women who are subjected to dangerous risks due to a lack of services and equipment. Abortions, premature births and labor complications are at an increasing rate. The fact that women are not given access to pregnancy related healthcare is gender based discrimination. It is vital for women that the gap in access to maternal and reproductive health care is addressed. The humanitarian crisis in Gaza is forcing women, who often suffer from post-traumatic stress disorder, anxiety, depression and even permanent disabilities, to neglect their own needs to take care of their families. Ensure Israeli compliance with border procedures, not only facilitating access, but showing Palestinians the respect to respond to applications in a timely manner consistent with medical requests. Put an end to aggressive and invasive interrogation practices at the border. Where women are concerned, allow access in all but the most pressing cases. Provide meaningful and adequate reparations for women that have been unjustly searched, interrogated, or subjected to inhuman, degrading or similar treatment at border crossings or in permit applications. Ensure Israeli compliance with the clear IHL obligation to allow humanitarian access to Gaza. End the blockade of the Gaza Strip. Facilitate the free movement of infrastructure and energy supplies. Grant Gazans the opportunity to rebuild their lives after the 2014 war. Israel’s actions against Palestinian women refugees, women living in Jerusalem, female prisoners, and women living in Gaza, as stressed in the report, are discriminating and in clear violation of International Law and the International Human Rights and are a clear result of the gravity of Israeli officials impunity. The policies outlined in this report contextualized by, wider systems of discrimination against Palestinians. Free movement is being curtailed, individuals are being coerced off their land, and individual rights are being removed. These are fundamental breaches of international law, and must be recognized as ethnic discrimination. The international community has again and again urged Israel to allow the return of the Palestinian refugees, stop the forced eviction and forcible transfer of Jerusalemites, respect the international standards of treatment of women prisoners and let Gazans have access to basic healthcare but the international community’s effort to make Israel change its policies has been ignored and they have failed in holding Israel accountable for its actions. Women’s rights, enshrined in conventions such as CEDAW, Israel and its violent occupation, creeping annexation and ethnic cleansing is bolstered by the failure of the international community to hold Israel to account. Israel and the international community are responsible for the suffering of the various groups of women discussed in this report, as well as the subjugation and suffering of Palestinians. More broadly, Israel will continue to force Palestinians to live as second class citizens without civil, political, economic, social nor cultural rights.